Welcome to another Monday morning edition of FWF. As was the case earlier this month, all the action last week took place at the end of the week, so I needed the weekend to catch my breath. But what a week it was: final exams, commencement, and a very special recognition ceremony in the ECE Department. The spring commencement ceremony was held Saturday morning in the hockey arena at the Student Development Complex. This is always a wonderful celebration and I love being a part of it. This spring the department sent off 7 PhD students, 76 MS students, and 92 undergraduates, and most of them were there to walk across the stage and receive their diplomas. These are some pretty big numbers for us, especially the graduate students, and that contributed a little bit to the ceremony being some 3 hours long this year. Here’s a little confession: on Friday a number of guests in the department asked me how many students we were graduating, a number that someone in my position would know, one would think. This happens every year and I am always caught short. I usually don’t know until I open my commencement program and start counting! One of those students was Marco La Manna, my first PhD graduate at Michigan Tech. Marco did his PhD dissertation in radar signal processing, and is now a post-doc at the University of Wisconsin-Madison. It was a very nice moment to be a part of Marco’s hooding ceremony, and I know the same is true for all of our other PhD graduates and their advisors. Growing the PhD program is a key component of our departmental strategic plan, so being able to make an individual contribution to that effort was very gratifying. The personal and professional relationship that I have developed with Marco and his wife Samantha over the past few years is equally satisfying. The main event for me this year was not commencement itself but rather a special event that took place the day before and rolled right into commencement. This year we recognized the first woman graduate of the ECE Department, Patricia Anthony, on the occasion of the 50th anniversary of her graduation in 1967. 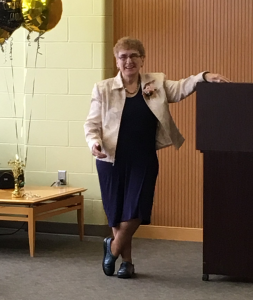 Pat was inducted into the ECE Academy on Friday afternoon, in a well-attended ceremony in the social area on the 5th floor of the EERC. Pat came to Michigan Tech in 1963 following graduation from high school in Grandville, Michigan. She entered with interests in math and science, as one might imagine, and while here she was VP of the Lambda Beta sorority, a DJ at the Wadsworth Hall radio station, and was a member of the U.S. Army ROTC auxiliary, the Silver Stars. She graduated from Michigan Tech in 1967 with the degree Bachelor of Science in Electrical Engineering, the first woman to do so at Tech. Immediately after graduation Pat took a position with IBM, where she spent most of her career. Her first assignment was in Kingston, NY, as a diagnostic engineer for large mainframe computers. She later transferred to Detroit as a systems engineer working in data communications. She become well-known within IBM as an expert in the area, and later took on responsibility for teaching data communications management to IBM customers. Her later assignments were in Dallas, Tampa, and Midland. Throughout her professional career Pat found time for community service activities, including Junior Achievement, United Way, and the Girl Scouts. Again, one would think that someone in my position would have been aware of Pat’s story for a long time, but in fact I did not know about it until I received an e-mail this past January from her brother, Col. Stephen Anthony (USAF retired), nominating her as a distinguished graduate. At first I did not believe that the first woman graduate of the department would have been as late as 1967, but I checked with Brenda Rudiger, head of Michigan Tech Alumni Relations, and indeed it was true. Brenda also pointed out that this was Pat’s 50th anniversary year. That set everything in motion which eventually led to this weekend’s events. Not only was Pat honored in the ECE Department, she was recognized briefly by the provost during the Board of Trustees meeting on Friday morning, and she attended commencement in the presidential skybox and got a shout-out from President Mroz in his opening remarks. Pat was inducted into the ECE Academy on Friday afternoon, in a ceremony that was unusual for us for recognizing a single individual. We had a number of speakers lined up, all of whom were insightful, inspirational, and brief: Jackie Huntoon, Provost and Vice-President for Academic Affairs; Wayne Pennington, Dean of the College of Engineering; Martha Sloan, Professor Emerita in ECE and the first woman president of the IEEE; Linda Ott, Professor and former Chair of the Department of Computer Science; Glen Archer, Associate Chair of the ECE Department; and Rachel Kolb, Treasurer of the Michigan Tech student branch of the Society of Woman Engineers. In one way or another, everyone spoke to the value of pioneers like Pat in paving the way for other women in STEM fields. Pat herself got the last word, and recounted her experiences at Tech, her experiences in industry, and in an emotional closing she touched on the importance of service activities like Junior Achievement that encourage young people of all stripes to pursue their dreams. An event like this, recognizing the first woman graduate of the EE Department, gives us the opportunity to reflect on where we have come in the past 50 years with regard to women enrollment in STEM fields. To this day we still struggle in the ECE Department, with undergraduate female enrollment hovering around 10%. I believe in my heart that we can and should do a better job of attracting more young women into ECE. At the same time, however, I have a deep admiration and respect for the pioneers like Pat who have struggled against the odds and have come out ahead. I feel the same way about the extraordinary women that I have met in the Presidential Council of Alumnae, the advisory group to President Mroz, all of whom have become leaders in industry and civic affairs. Female students at Michigan Tech are represented in student leadership positions campus-wide in numbers much higher than their proportion of the undergraduate population, and that has been true in the ECE Department as well. There is a spirit of Sisu in the Husky women students and alumnae that sets them apart, on campus and in their careers, and being here in small numbers probably has a lot to do with that. I am not suggesting for a second that we should slow down our efforts to bring more women into ECE, nor should we ever tolerate ANY attitude that would make the ECE Department less than fully welcoming, inclusive, and comfortable for all students (that goes for faculty and staff too.) I guess I am just being somewhat wistful and counting myself as lucky for having had the opportunity to get to know the amazing women like Pat who have been, and continue to be, on the leading edge of the movement to change the face of electrical and computer engineering.